The Bosporan Kingdom at the time of my Severan Dynasty Project (2nd/3rd c. AD) covered the Crimea and the Taman peninsula to include the marsh areas and the mouth of the Don River. 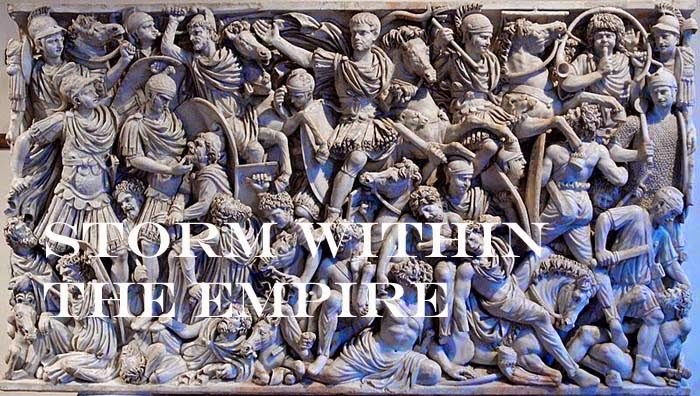 It was for a brief period a part of the Roman Empire until Galba restored the kingdom to Rhescurporis I in 68 AD. For the next three centuries the royal houses of Bosporan were able to retain an autonomous rule over their domain. Bosporan economic activity centred around the export of grain, gold and slaves. Keeping their commercial interests alive around the Black Sea was not without a continuing struggle to keep it free from attack as the kingdom was in a perpetual war with various Scythian and Sarmatian tribes. To maintain a Roman presence in the region was the task of the fleet. However, during the 1st c. AD there is documentation of Roman garrisons in the region, but these disappeared when Galba restored autonomous rule. By the following century we do find renewed military activity at the end of the 2nd century with the presence of vexillations Legio I Italica and XI Claudia. Their presence took the form of engineering works and road construction. During that same period we do record the raising of a number of Bosporan auxilia units for service within the Roman Empire; the Alae I Bosporanorum M. (Syria-Dacia) and the Cohors Bosporanorum M. (Cappadocia), I Bosporanorum (Pannonia Superior), II Bosporanorum (unknown). The Bosporan army list (II/25) covers our period from 10 BC to its demise by the Huns in 375 AD. In Armies and Enemies of Rome by P. Barker, Bosporan units would likely have appeared similar to Roman units of the period. Of the items listed above, the lancers and horse archers were the only figures that needed ordering. Foot figures are done but need some details painted. The bolt shooter needs to be constructed to fit a mule cart and hopefully after a week of receiving the cavalry, this army will be ready to do battle against the Alani, Sarmatae and Gothic pirates. Clothing colours according to Phil Barker’s book are bright for the mounted units, not unlike the Gauls or Germans which leaves the foot units wearing most likely bleached or un-bleached linen. The figures used for my Bosporan are all Old Glory for which the mounted are Sarmatian knights with an equal number of Scythian horse archers. The spearmen are listed by OG as Greek Colonist and archers are extra Palmyran and Sassan figures. The link illustrates possible clothing colour. In the illustration is a standard bearer of the period (2nd c. BC) and as my Bosporan are of the later 3rd century AD they will carry Draco standards. The command element will have a labarum standard with a religious motif. In the book, The Supreme Gods of the Bosporan Kingdom, Yulia Ustinova describes the older gods and goddesses were still revered as late as the 4th century AD which offers some interesting options for a banner. This past year my Middle Imperial Roman army have fought battles as a single, double or triple sized command against the many enemies I have collected to-date; Picts, Caledones, Marcomanni, Quadi, Carpi, Moors, Sarmatae, Alani, Parthia, Arabo-Aramean, and Sassanid. This leaves the Armenians and Pre-Islamic Arabs remaining in the queue for a thumping. I have mentioned in a previous post how a number of rule clarifications and improvements in 3.0 have increased the tempo of the game and how this modified my tactics. Conversely, because the pace became faster I have now seen the advantages to slowing down the pace of my opening game. What may appear to my opponent as “slow” are actually the coiling moves of a viper preparing to strike. Allocating the highest and lowest pip score to the various commands with the older version was simply a matter of which command needed to move often (mobile command) and the lowest score would go to the “reserve” command. That changed when I began looking beyond the opening moves and to where my high score would best be needed, the “middle game”. Now the central command (CinC) receives the highest score and the smallest of the three commands, the lowest. The reasoning for this was the central and strongest command lacked the needed pips to generate decisive moves and therefore struggled to finish the game. Games subsequent to the change are much improved. Further, I began re-evaluating the effectiveness of an all mounted command. During the early 3.0 testing this command usually took a beating. I remedied this by changing the composition of the command from a purely mounted one to a mix of troop types; blade, auxilia, one archer, and cavalry or in essence a battle group. Its purpose was to delay or frustrate the opposition while leaving the other two commands to deal with the enemy. To fine tune this we did a number of training sessions. The training sessions focused on the effective combination of troop types that needed low pip maintenance and were effective in difficult terrain. An element each of blade, bow and auxilia with an element of Psiloi dancing around and enemy flank worked well against warband strong armies. With the general and a second auxilia element or cavalry unit this becomes quite an effective command against enemy of greater strength. Held together as a group this command can still be effective while demoralized as bow can still be effective at distance shooting and receive side support from blade. A blade’s factor may be reduced to 3, but this does not mean it is incapacitated. The fight is still on. I saw further improvement when I began to slow my tempo down. Light Horse and Psiloi, under the right conditions, can make extra moves and I did make use of this during the early stages of testing. As my tactics improved, I found that LH and Ps were better employed during the middle game and not launched full speed at the opening. Changing this, Light Horse have been effective at slithering between enemy commands to frustrate enemy reserve formations, or picking off a general or forming up to strike the rear of an enemy battle line. Please note after multiple moves you may not approach closer that 1BW from the enemy. Psiloi do not move quite as far but do need the advantage of ground to do such. This is one of the reasons I have redesigned my terrain pieces as small to medium size; this reduces the chance that pieces will be discarded during the placement phase and secondly, features spaced 1 ½ BW from each other function as “stepping stones” allowing Psiloi to manoeuvre over. In which command will you place LH and Ps is a matter of preference and your style of game. Most Roman armies have too few LH, but I have found it useful to have them with the central command and Ps deployed with the flanking commands. The following revelations are based on the games played between the Middle Imperial Romans at its 2nd/3rd century opponents. There is one historical match up I have yet to do and that is a Civil War for which I have three western armies (S. Severus) ready to fight three eastern armies (rival claimant). To be honest, this is one match not high up on my list. Warband strong armies, such as the Marcomanni, Quadi (solid) or Carpi, Britain (fast) should not be feared. Do keep in your mind you will lose a blade element or two as “Fortuna” has her moments. Most effective troop types to frustrate warband are Auxilia as these can go toe-to-toe with barbarians in open or difficult ground unlike the Legionnaires. Pike armed Picts are a novelty and have the same shortcomings as warband strong armies; the use of elements to offer rear support greatly reduces a command’s frontage. By turn three, certainly four the Picts should be locked in combat with your battle line. It will soon become a shoving match and invariably the Picts will lose patience and feed their cavalry and chariots into battle. Now it is your turn to commit your reserves and finish the battle. Auxilia and Psiloi strong armies, such as Armenia and the Moors should pose less a problem than warband armies, but great care should be taken to not lose patience as unsupported attacks may be your undoing. Such an army will more than likely defend and have terrain advantage (difficult hills) so you will have to be methodical when clearing defended ground. Archers and artillery are best at clearing ground like this. Cavalry armies with a majority of Light Horse can pull off interesting surprises. In my collection I have Parthian and Alani armies and each time I fight against these two I remember Alexander’s counter to the Massagetae. I recommend this. Further, Auxilia are a factor 3 when fighting mounted and win on ties, so this significant change should be capitalized by a Roman player. Cavalry armies which have Knights and I include the two types, 3Kn and 4Kn (Sarmatae, Sassan and Parthia) can be worrisome but you have more effective tools at hand, the archers and artillery. As with warband armies, be prepared to lose some legionnaires in close combat with knights, but do be ready to deal with the breakthroughs the make. Knights move just as fast as Psiloi and become nervous when confronted by a column of two deep LH. To better illustrate the change in game style the following series of photos will best show the difference between the two versions. Here the Middle Imperial Romans (Western) are used as an example of an army deployment with a mix of cavalry and infantry. DBA 2.2 required that commands be positioned within 600 paces (6”) of their own base edge and though you could change the composition of a command the smallest must have no less than 6 elements. Note: the string marks the center line of an 80 x 160 cm game board. The distribution of troop types into three commands followed a tried and true recipe; one large central command with a supporting wing and a smaller mobile command positioned on the opposite flank. To maintain a steady advance to engage the enemy, commands generally moved forward as a group two deep or with columns formed up on the flanks. On average this process took three or four bounds to reach the centre line and engage the enemy if your opponent was like–minded. With the distance between opposing battle lines and the shorter movement armies usually took the opportunity to readjust their units before coming to grips with one another. As battle lines could extend to the side edges hampering any turning movement the game settle down to a long slugging match. Two or more hours later you reached a concluding end. Two noticeable changes with DBA 3.0 are the enlargement of the deployment area allowing troops to be positioned 3BW of the centre line and which troop types could be positioned on the flanks, up to 2BW of the side edge. This new deployment area meant close combat was possible with “fast” or mounted troops within the first turn. The new deployment and increased move distance now accelerated the game, such that a re-thinking of deployment was in order. First solution was to create deeper formations. The Middle Imperial Roman army strength lay with its core of “solid” infantry (Bd, Ax) and a respectable selection of cavalry (Kn, Cv and LH). The revised army lists now allow an increase in cavalry and artillery are now an option. From the large number of games against historical opponents and these are Picts, Caledones, Marcomanni, Quadi, Carpi, Sarmatae, Moors, Parthia, Armenia, Arabo-Aramean, Pre-Islamic Arabs, and Sassanid I have developed a balance of troop types within each command and their role when fighting any of the above enemies. These early battles with the Middle Imperial Romans, I organized two relatively equal sized commands and a smaller command comprising the majority of the army’s cavalry. This worked well with the older version, but less so with 3.0. The smaller command was usually mauled and demoralized in short order and the supporting wing would follow shortly thereafter. This was due to the rapid movement of the enemy to counter my threats or underestimating some of the changes to close combat, such as side support and rear support for LH. These minor setbacks prompted me to reassess the usefulness of maintaining a mobile command. Some of the most compelling changes were multiple move possibilities by Light Horse and Psiloi; the latter by reaching difficult ground on their subsequent move. If Psiloi were used these were placed on the flanks while the LH were collected as a central reserve. This change meant the legions supported by auxilia would open the battle while the cavalry would engage the enemy a few bounds later. Part three will cover specific tactics I found useful against the “barbarians”. I am reading at TMP (The Miniatures Page) and Fanaticus more new players are expressing their interest using the DBA 3.0 big battle option with a preference for historical match ups. That is good news. Our historical match ups have centred on the major armies of the 3rd century AD; Rome vs. Early Germans, Parthia vs. Sassan and either one of these vs. Rome and with plenty of minor armies to add as an Ally which do provide a mix of troop types adding spice to a game. Recalling my earlier experiences with 2.2 and the big battle option I have found my style of game has changed with DBA 3.0 and this is principally what I wish to share here. These points are not earth shattering, but players with some big battle experience will recognize familiar trodden paths. I found with DBA 2.2 my games were characterised by maintaining an unbroken battle line of three commands. To ensure any holes were quickly filled, reserves, were usually positioned directly behind and in contact with the main battle line which meant they were essentially committed to that particular section of the line. The entire army would do its best to move forward while cavalry would protect its flanks from enemy encirclement. DBA 3.0 with its increased move distances I can now position my reserve formations further back knowing they can be quickly employed when needed; in the case of mounted troops this can be 4BW or more or half that for reserve formations of infantry. I also find leaving space between commands an advantage (2 to 4BW) as formations can quickly be extended with the use of reserve units. This evolved to an interesting ploy as the smaller front worked as a lure for an opponent believing an advantage could be quickly gained against small numbers. Redefining the deployment area and permitting certain troop types to form up on the flanks has helped move our game along historical lines and this prompted a quick brushing up on such classic writings as Vegetius and Frontinius. Further changes to the rules or clarifications have help improve the speed of play and two such stand out in my opinion; the conditions needed to flank an element and threat zones; these will be covered in detail below. With the older version we found the limitation of time influenced how we deployed. As our games averaged 2 hours or more the pressures was on to finish a game within the allowable time and reach a decision. This resulted in tactical moves that were more desperate charges than tactical genius. Under 3.0 these same games now average slightly over an hour, which not only opens an opportunity for a second game, but more importantly, we are now beginning to exercise more thought and cunning. Additional improvements and clarity regarding flanking an element and threat zones also helped game flow. Flanking an element is now better defined and eliminates the long periods of pre-measuring and element gymnastics and wheeling a group is better defined and allowing groups to “slide” and neaten contact for close combat. The Middle Imperial Roman army deploy within 600 paces of its base edge. Artillery were a requirement under the 2.2 army list for the western army and the presence of archers (4Bw) made this a predominately infantry strong army. Next post deals with the positioning of troops.